If you get the opportunity to go to Rome, you might visit the church of San Pietro in Vincoli where you can see Michelangelo’s famous statue of Moses. The rays of light on Moses’ head are represented by two marble horns. That is the problem with a medium like marble. How could even Michelangelo convey the radiance of light which transfigured Moses as he came down from Mount Sinai, carrying the second set of the tablets of the Covenant? The Hebrew phrase קָרַן עור פְּנֵיו – suggests that Moses had a luminous appearance and that his skin was radiant. The verb קָרַן resembles keren, the Hebrew word for a horn, so it was not entirely unreasonable for Michelangelo to represent this incandescence as horns, although, in my opinion, a halo would have done the trick. When the bible was translated into Latin, early in the fifth century, קָרַן עור פְּנֵיו was interpreted as meaning that Moses face was horned, cornuta esset facies sua, since you ask. 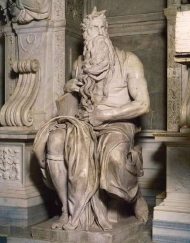 This launched a tradition which obviously influenced Michelangelo, although the Jewish commentators dismissed the idea of a horned Moses as foolishness or heresy. The Hebrew word עור in this text sounds like the word אור which means ‘light’ but the spelling is different – with an ayin instead of an aleph – and it means skin. It could be connected with עֶרְוָה, nakedness, and it should be noted that Moses covers his face with a veil, to conceal from the Israelites the naked radiance which they view with consternation. A medieval Jewish interpretation is that Moses covered his face with a veil ‘…out of respect for the rays of majesty.’ The majestic nature of the rays, which is not explicit in the text, was inferred also by the Jewish scholars who translated the Hebrew bible into Greek in the third century BCE: the Greek Septuagint says that Moses’ face was glorified. Karnayim, a plural form of keren, is much more intelligible as radiance than as horns. It is the only similar use of the word in the bible, but that is enough for it to offer evidence of linguistic meaning. Sigmund Freud wrote an essay on the subject of Michelangelo’s Moses. He noted that Michelangelo represented Moses as fiercely angry, and Freud therefore associated the statue with the narrative of the golden calf, which, as it happens, occurs earlier in this same sidra, Ki Tissa. Moses was indeed angry when he saw the Israelites dancing round the calf, so much so that he broke the first set of tablets. We see from our sidra that Moses received a second set of tablets, in place of those which were broken, and his face shone when he descended with these, the second luchot ha brit. Freud would have known this if he had gone to shul more often. The word for a veil, מָסְוֶה, is not found elsewhere in the bible, so its exact meaning can be known only from the present context and from a small number of similar words which mean cloak, cover or curtain. The author Richard Elliott Friedman suggests that Moses’ veil has something in common with the curtain which covered the Holy Ark in the Tabernacle. The Ark had a holiness which could be dangerous to those who came close to it, and so did Mount Sinai, ablaze with fire which no one but Moses could approach. God said to Moses: You cannot see my face for no one can see me and live, and it is as if Moses’ face may not be seen, because it reflects his encounter with God. It is interesting that Moses himself was unaware of the rays which were observed at once by Aaron and the Israelites. Moses knew not that the skin of his face sent forth beams. The man Moses was very meek, above all the men that were upon the face of the earth. This seems an apt description for a man who had no idea that his face reflected his meeting with God, and who, learning that this was so, covered it with a veil so as not to be an object of wonderment to those waiting at the foot of the mountain.